Back in November 2013 our trustee John Ashwell and voluntary Manager Sophie Talbot started planning a street tree maintenance day in which members of the community would be invited to work in pruning and sprucing up street trees in one section of King’s Cross. 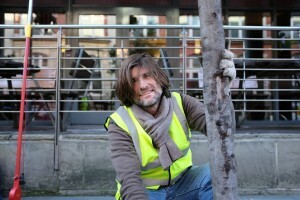 A few years ago John had fundraised to buy the vast majority of trees in the north east quarter of King’s Cross. He worked with Islington Council’s tree department to pick the best trees for each spot, identify and survey tree pits and to plant the trees. 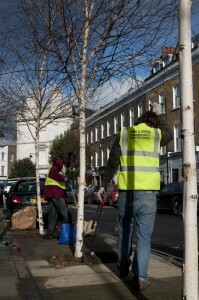 Since then John has continued working with Islington Council on maintenance and replacing vandalised or car and lorry damaged trees. The tree team at Islington Council has recently won the Forestry Commission and Mayor of London’s Award for Excellence in Tree and Woodland Work by a Public Body. 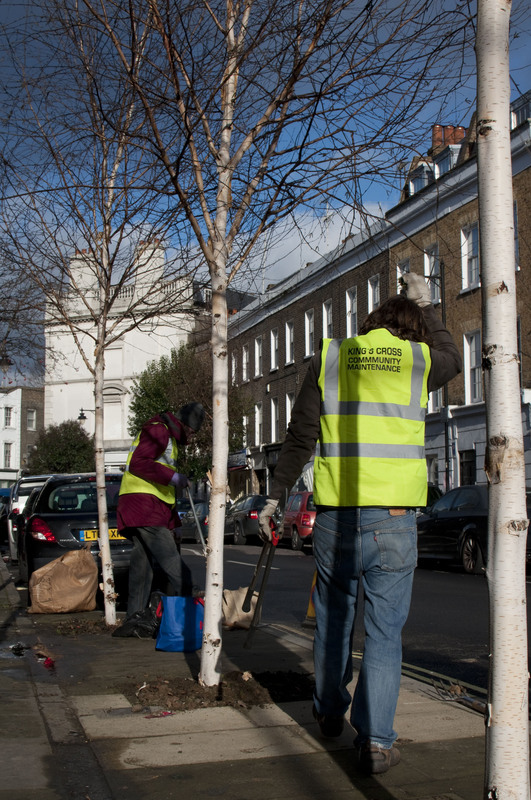 John liaised closely with Islington again in arranging street tree maintenance day and we can’t thank them enough for all the support they’ve given. Invitations were sent out to the local community on this website and on the King’s Cross community website kingscrossenvironment.com. The response was fantastic. Although not everybody was able to make it on the day, we did get nearly a dozen people willing to give up those very precious Sunday hours starting at 10am. Simon Castle, a locally based housing association maintenance specialist whose area of expertise include health and safety and is a qualified first aider, advised Sophie on producing a ‘Safety First’ document and safety register. Simon also volunteered on the day. It was a wonderful day, we were amazed at how much got done and what a lovely atmosphere there was – despite all the hefty lugging of tools and tree waste. Conversation was lively throughout with ideas for the next events flowing. As a result we hope to run a spring planting day. We’ll be approaching Islington Council for permission to plant up those tree pits suitable for ground level plants to really give the area a spring boost of colour. If you would like to participate in the next event – whether for the whole thing or part of it – please contact us. 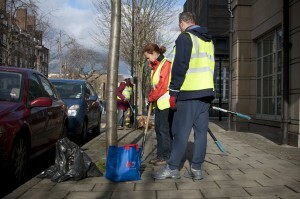 We’ll also put news on kingscrossenvironment.com and, hopefully, the free local paper, the Islington Tribune. In this short film we tell the story of what we did and where.